Tess Harding (Katharine Hepburn) is a progressively-minded political journalist. Sam Craig (Spencer Tracy) is a sports writer with very traditional values. The only thing the two have in common is that they both work for the same New York City newspaper. Despite an initial and mutual dislike, the two eventually fall in love and get married. 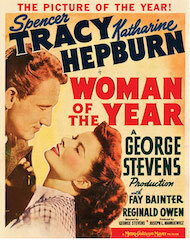 When Tess wins the Woman of the Year award, traditional gender roles become flipped and their relationship suffers as a result.